The Yorkshire Dales National Park covers an extensive area, which contains a wide variety of scenic interest. Each Dale is usually named after its river although there are a few examples that don't follow this rule. The varied underlying geology is reflected in the scenery with limestone and gritstone the prominent rocks resulting in virtually every type of scenery from dry valleys to wild moorland. The gritstone and limestone scenery of the Yorkshire Dales covers 683 sq.miles (1769 sq.m). The third largest national park after the Lake District and Snowdonia, the Yorkshire Dales are based predominantly on rocks laid down in the Carboniferous period over 300 million years ago. Variety is the keynote - picturesque market town like Hawes, wonderful villages aplenty, geological interest everywhere, industrial archaeology, wild moorland, plus of course many fine mountains and areas of upland. The "Dales" provide miles of wonderful walking in ever changing scenery with the dales themselves dominating the scene. Higher ground abounds culminating in the three classic major peaks of Ingleborough, Whernside and Pen-y-ghent. Elsewhere notable summits are found throughout the park, most providing relatively easy walking to their summits, which offer fine panoramic views over the surrounding countryside. Malhamdale - Well-known dale with many superb features. Malham Cove, Gordale Scar, Malham Tarn and the wonderful limestone pavement above the Cove are just a few of the highlights. More detailed exploration of the area will uncover many "hidden gems". The village of Malham is very busy on fine weekends in the summer so perhaps choose a sunny day in the winter for your walking. The Howgills - one of my favourite places to walk, this distinct area of upland is covered in a separate where to walk description. Wharfedale - the "Queen of the Dales". The busy village of Grassington forms an interesting gateway to this Dale of contrasts. At the southern end of the Dale, the Wharfe occupies a broad open limestone landscape but this changes as you continue up the dale. Slowly the valley narrows and deepens with the millstone grit moors filling the skyline. Highlights of the dale include Mastilles Lane, which was used by Cistercian monks as they travelled between their estates, the imposing Kilnsey Crag, the limestone gorge of Conistone Dib and the extensive limestone pavements above Grassington. Those in search of higher peaks will be well rewarded by climbing Buckden Pike and Great Whernside - the latter not to be confused with its namesake Whernside at the head of Ribblesdale. Ribblesdale - dominated by Whernside, Pen-y-ghent and Ingleborough this is "Three Peaks" country. Although the well known trio of mountains dominate the scene there is much to discover. Waterfalls, limestone pavements, the famous Norber erratics, waterfalls and the famous Ribblehead viaduct all vie for visitors' interest. As with most of "the Dales" the geology is a mix of gritstone and limestone which always adds interest to the scene. The small town of Settle provides an interesting gateway to the dale. Dentdale & Garsdale - the village of Dent, especially when there are few visitors, is a wonderful place to explore with its cobbled streets and lack of commercialism. 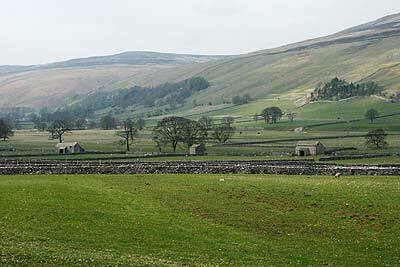 Dentdale and its neighbour, Garsdale are deep steep-sided valleys, with rounded fells towering on either side. The valley bottoms are lush and green contrasting with the browns and ochres of the heathery summits. Although not strictly part of the Yorkshire Dales national Park, nearby Mallerstang, dominated by imposing Wild Boar Fell is wonderful wild place to be. Wensleydale - arguably the most typical of the Yorkshire Dales, this broad valley has a string of beautiful stone-built villages. What it lacks in spectacular landscapes is more than compensated by the many little gems of scenic beauty. Aysgarth Falls, Castle Bolton, Hardraw Force, Hell Gill and the interesting market town of Hawes are all worth a visit. Swaledale - a rugged northern wilderness but once a hive of activity as miners battled to extract lead ore from the hills. Today the legacy of this "lead rush" are still in evidence adding plenty of interest to any walk. Gunnerside holds the greatest concentration of lead mining remains including the dramatic "hushes". The miners constructed dams high on the hillsides eventually breaching them to allow the water to scour off the soil cover hopefully exposing more veins of lead. The Old Gang Smelt mill is a well preserved structure also worth a visit. The village of Keld is a busy place for walkers being the crossing point of the Pennine Way and Coast to Coast long distance footpaths. Finally there is Arkengarthdale - forgotten by many but exhibiting a unique rural charm flanked by wild moorland.